Before Washington Gov. Jay Inslee and state legislators can even think about renewing or expanding research and development incentives for innovation industries, they need to find a way to fill a hole in the state budget on the order of $5 billion over the next four years. But in an interview with Xconomy on Friday, Inslee, a Democrat who campaigned on combating climate change, hinted at a potential solution in which a state cap-and-trade system to limit greenhouse gas emissions could help raise revenues to adequately fund K-12 education, as the Legislature has been ordered to do by the state Supreme Court in its McCleary decision. The upcoming election, in which every state House seat and about half of the Senate is up for grabs, is obviously a wild card. Inslee acknowledged that passing carbon regulations of any kind would be much easier if Democrats retained control of the House and took back the state Senate. He was cautious about revealing any specific strategies for resurrecting the state’s 20-year-old research and development tax credit and sales tax deferral, a top priority for technology companies across the state that legislators failed to renew. (It expires Jan. 1, 2015.) Likewise, he expressed strong support for the Life Sciences Discovery Fund, which he protected from defunding earlier this year with a veto, but could not make any guarantees. Inslee began his address to the life sciences meeting, which drew about 700 people, on a very personal note. 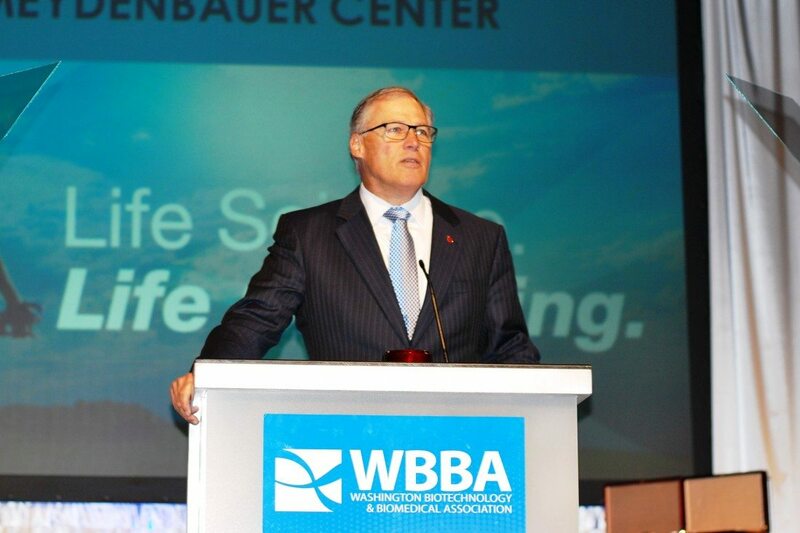 Inslee said he wants Washington to become “the global leader in life science innovation and healthcare delivery by the year 2025,” echoing aspirations of leaders of the Washington Biotechnology and Biomedical Association (WBBA), which is marking its 25th year. But there’s a mixed picture for biotech in Washington state today. Chris Rivera, WBBA president and CEO, said there have been more than 50 investments, partnership, or collaboration deals involving Washington companies thus far this year, bringing some $1.1 billion to the state, compared with about $800 million in 2013. (Much of that capital has flowed to one company: Juno Therapeutics, which quickly amassed $310 million in funding starting late last year.) There were a total of 34,200 direct jobs in the state’s life sciences industry in 2013, up more than 3,300 jobs since 2007. But the Seattle biotech sector’s anchor tenant, Amgen, is leaving town. Novo Nordisk is changing its Seattle-area focus. And Washington’s financial support for life sciences, already modest compared to the likes of Massachusetts, California, New York, and Texas, is precarious thanks to the R&D tax credit expiration, and attacks on the Life Sciences Discovery Fund as lawmakers seek revenue for education anywhere they can.